The Canfield Series 7C proximity sensors are used to sense position on pneumatic actuators equipped with magnetic pistons from 2″ to 8″ bore. This proven design is rugged yet cost effective. All switches feature a self-adjusting clamp that grips standard NFPA and custom cylinders eliminating stocking requirements of many clamps for different bore sizes. The Series 7C boasts the largest number of custom circuits to match applications found in the market. Examples include; 1 or 4 Amp reed switches, normally open, normally closed or SPDT switch types, reed or electronic sensing elements in the same package style, not to mention the industry’s first 120 VAC Hall sensor. The low cost 7C features a ½” conduit hub and wire lead to meet stringent electrical codes in certain regions and applications. The Canfield Connector Series 8WS reed and electronic magnet sensors are rugged yet compact switches used to sense position on pneumatic actuators equipped with a magnetic piston and 12mm dovetail groove. The switch can be slipped in and tightened from anywhere along the groove that is fabricated into the cylinder wall or clamping system. The switch features a die cast holder which clamps to the cylinder groove while the electronics are fully encapsulated and resistance to environment. 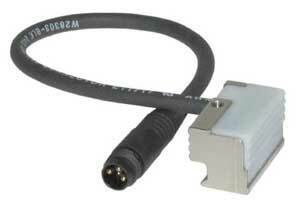 These sensors offer a wide voltage range from 0-120 V AC/DC 50/60Hz and have a up to a 500 mA switching current rating. The switch has a high intensity indicator light which indicates power to the switch and load. The switch comes standard with 9 ft. PVC or 8mm quick connect male pigtail. promotes ease of installation with a tight fit. Options include 9ft. PVC or 8mm quick connect male pigtail.